A material witness whose testimony contributed to the controversial “magic bullet theory” in the assassination of President John F. Kennedy has died. James Tague was standing in Dallas’s Dealey Plaza when the shots were fired on Nov. 22, 1963. A bullet presumably meant for Kennedy instead struck a curb near where Tague was standing and sent debris flying into his face. “It was just skin-deep, that’s all there was to it,” Tague told Yahoo News three months ago when he was the subject of a video story on the 50th anniversary of the assassination. Tague’s daughter, Suanna Holloway, said her father died at his home 70 miles north of Dallas on Friday following a brief illness. He was 77. Tague’s experience at Dealey Plaza ultimately led Warren Commission investigators to conclude that one of the three shots missed and that one of the rounds went through both JFK and Texas Gov. John Connally. JFK researcher Debra Conway said the commission was initially going to settle with two shots hitting the president and one hitting the governor. Critics of the Warren Commission have long questioned the so-called “magic bullet theory,” arguing that the bullet could not have traversed multiple layers and angles. By his own account, Tague was in Dealey Plaza by accident. “I was going to meet a cute red head for lunch,” Tague told Yahoo News in his trademark Texas drawl. But when traffic came to a stop in downtown, Tague got out of his car to investigate. That’s when he saw the president’s motorcade heading toward him. Then came the gunfire. “I guess 50 years later I’m still trying to absorb all of it,” Tague told Yahoo in November. A native of Plainfield, Ind., Tague served in the Air Force before settling in Dallas. He sold cars for three decades and managed one of the top dealerships in Dallas before retiring. Through the years, Tague’s own curiosity transformed him from eyewitness to JFK assassination researcher. 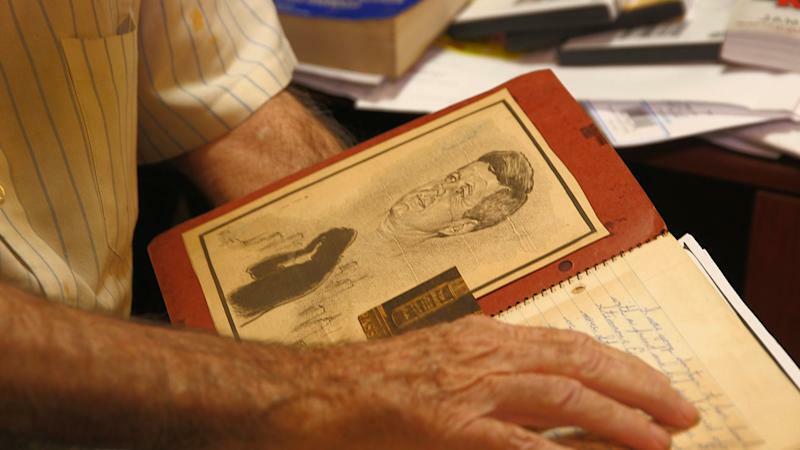 He befriended other JFK assassination buffs, visited the National Archives to inspect evidence and amassed a huge collection of Kennedy-related books, some of which he sold on eBay. Tague also authored two books, including last year’s “LBJ and the Kennedy Killing” in which he alleges a cover-up plot. “Personally, I’m urging young people to keep the truth alive,” he told Yahoo News. Even in the months before his death, he still made daily trips to the post office to send out autographs to people seeking a tie to that fateful day in Dallas. “I did not let it consume my life; I just say it made my life interesting,” Tague said. In addition to Holloway, Tague is also survived by another daughter, two sons, and seven grandchildren. A memorial service is planned for 2 p.m. Tuesday at American Funeral Services in Denison, Texas. Follow Jason Sickles on Twitter (@jasonsickles).